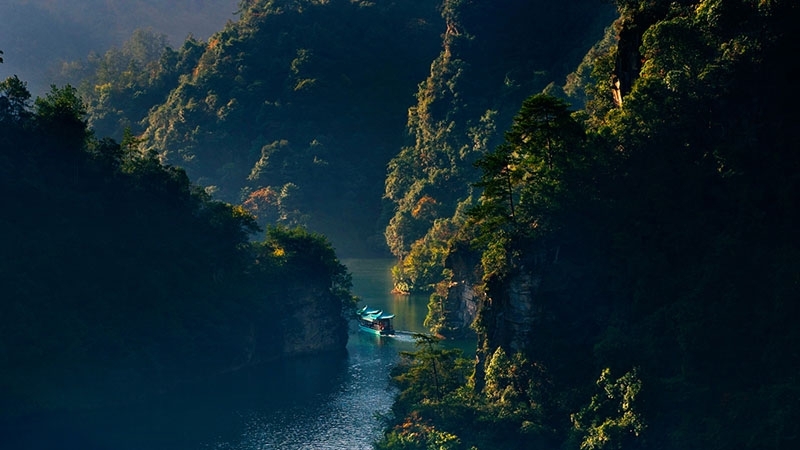 Wulingyuan Scenic Area is made up of Zhangjiajie, Tianzi Mountain, Shuoxiyu, and Yangjia Boundary. It was listed as one of the world legacies in 1992 and as a world geology park in 2002. Wulingyuan Scenic Area has a peculiar natural landscape, which features original sandstones, dense forests, and deep ravines. There are thick forests and running streams in the area, creating a picture that resembles a landscape painting. The five most spectacular scenes in this spot are the unusual peaks, deep canyons, beautiful waters, thick forest, and mysterious caves. The peculiar peaks refer to the 3000 or more mountain peaks made of quartz sandstones. These peaks are of various shapes and sit both low and high, and the three representative peaks are Camel Peak, Drunk Stone Peak, and Five Finger Peak, which are elegant and magnificent. The deep canyons refer to 32 canyons, each more than 2,000 meters in length. The most famous ones are Jinxi Canyon, Shentang Canyon, and Gallery Canyon. The beautiful water refers to the waterscape in the scenic area, including streams, springs, lakes, pools, and waterfalls. It is said that there are more than 800 waterscapes in the area. Meanwhile, caves of different shapes can be found here. Among them, the most outstanding one is Yellow Dragon Cave, which contains beautiful stalactites. In addition to the five top scenes mentioned above, the rural landscapes also attract a lot of visitors. The local farmers are hospitable and you may visit their homes. The Yellow Dragon Cavern is one of the earliest caves open for tourism and it is known as the wonder of the world’s caves. Yellow Dragon Cavern is a typical Karst cave, consisting of an area of irregular limestone in which erosion has produced fissures, underground streams, and caverns. So far, the discovered cave area is about 15 kilometers long and 140 meters high, and covers 48 hectares. The Cavern can be divided into two parts. One is the dry cave and the other is the water cave. In the Yellow Dragon Cavern are caves inside caves, and one cave may lead to many others. Sometimes there are also underground caves. Stalactites, stalagmites, stone blossoms, stone curtains, stone branches, stone canals, stone pearls, and stone macrospores can be seen in various places in the cavern, constituting a fantastic yet natural scene. The features of the Yellow Dragon Cavern can be summarized into six sentences. First, the cavern features numerous mysterious caves. 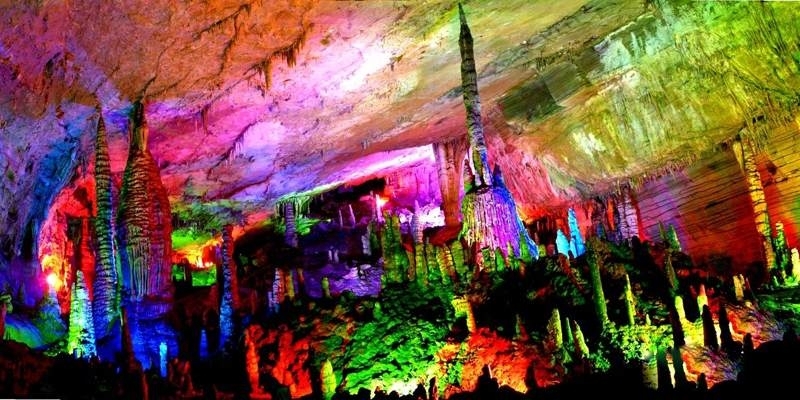 Second, it is one of the largest Karst caverns in China. Third, the limestone in the cavern comes in a variety of fantastic shapes. Fourth, the limestone here is colorful, glittering and translucent. Fifth, the limestone and the water sometimes create attractive sounds, like music from heaven. Finally, boating is possible in the under streams in the cavern. The Baofeng Lake Scenic Area is part of the larger Wulingyuan Scenic Area, one of the world's natural heritages. It is situated at the back of Mount Baofeng, with an area of 274 hectares. The area comprises Baofeng Lake and Yingwo Stockaded Village. The natural beauty of the lake and the mountain complement the human culture and landscape. Baofeng Lake features beautiful natural scenery. It is located in the mountains, where there is abundant water and fresh air. Green trees and stone peaks of various shapes surround the lake. There are also marvelous running waterfalls pouring out like troops from heaven descending to the world. Yixiantian Valley, less than an average of four meters wide, is another wonderful scenic spot. Only a line of the sky can be seen from the bottom of the valley, which resembles a seemingly long and thin silk thread. The length, narrowness, and depth here are rare for national scenic spots. Mount Baofeng, at a height of 1,212.8 meters, is nearby and points straight up to the sky. Yingwo Stockaded Village is strategically located in the terrain and is difficult to access. By reaching the top of the mountain, you can look down upon many smaller peaks. Within the green background is Baofeng Temple, gracefully ancient in color and style, half hidden and half visible, and radiating the ethos of a religious culture. Lake Baofeng lies calmly, like a goddess, outstanding and pure, projecting a sense of peace. If you boat in the lake, you can see the reflection of the marvelous stone peaks and green trees in symmetric display, creating great pleasure for visitors. 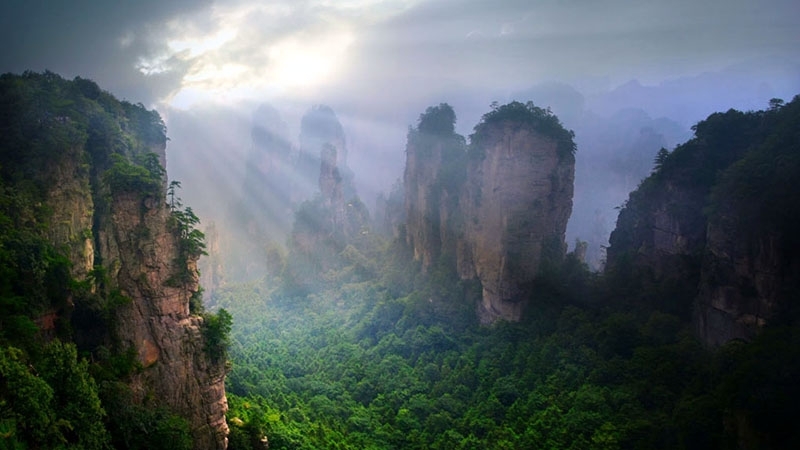 Zhangjiajie grand canyon is new discovery outside Zhangjiajie National Park,Zhangjiajie Grand Canyon situated in Sanguansi, cili county Zhangjiajie city, 10 km east to Wulingyuan world natural heritage site, which is a new discovery of scenic site. When driving close to the entrance a expanse of bamboo disappear, you find a deeply lower Valley with cutting-edge cliffs.a hill path cutting through narrow crevice leads vertically to the bottom of the valley, the area is about 60 square km. Zhangjiajie Grand Canyon attracts tourists with its magnificence, rareness, magnificence and beauty. 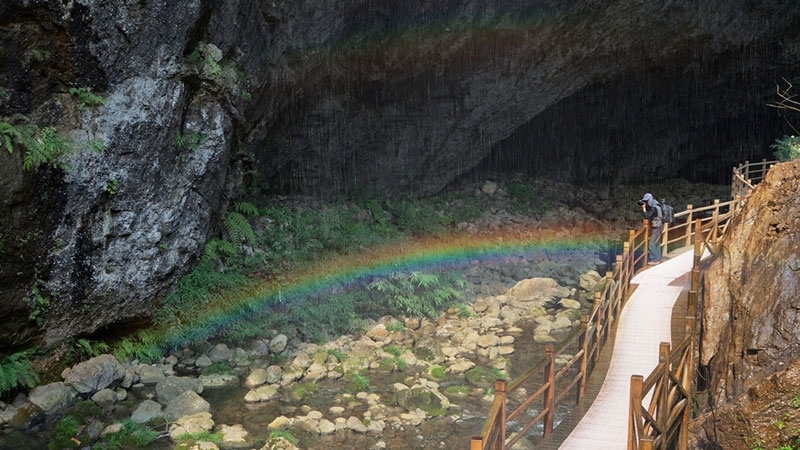 It has become a sparkling pearl in the border area of Zhangjiajie. It is very common to see the beautiful waterfalls, you just feel you come to the paradise when enter it, with fresh air, birds singing, green mountain and so on, you can relax yourself completely. On the bottom of the great canyon it is a clean brook, there is a tourism wood road built along the brook. Zhangjiajie Great Canyon also possesses deep culture, in Ming dynasty, Wu Sangui had several bloody battles with Li Zicheng. So it is also called “one thousand grave” ancient battlefield.